darkmoonmetals.com – Forging our own path one project at a time. Darkmoon Forge is a small welding and fabrication shop located in Norwalk, CT. One of the many things that sets us apart of the bigger industrial welding facilities is we work mostly with the general public. We understand the value of a dollar, we look for cost effective and creative ways to stay well within your price range while at the same time maintaining a high level of quality. We are artisan metal workers using everything from an anvil and forge to advanced CNC plasma cutting systems. Combining time honored traditions of the village blacksmith with cutting edge technology to create one of a kind custom projects for our clients. 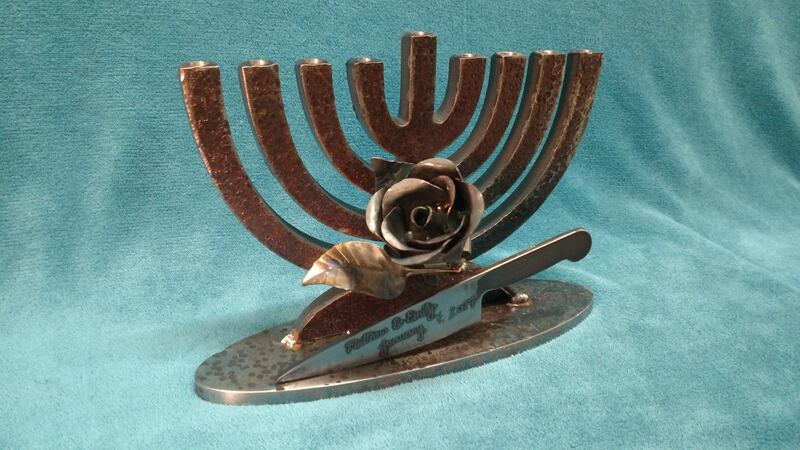 This menorah is a perfect example of what we are capable of. Made as a wedding gift, our client wanted something that would reflect the personalities of the bride and groom. Being a chef the client opted to incorporate a French knife into the design, this was also the perfect place to engrave an inscription for the happy couple. The rose is the brides favorite flower, we created one for her that will be in full bloom throughout all the days of their marriage. The entire piece is solid steel and weighted in around fifteen pounds, this is something that will last a lifetime and perhaps become a family heirloom. Many people own items where replacement parts are no longer made. One such example is the hinge pin to the left. 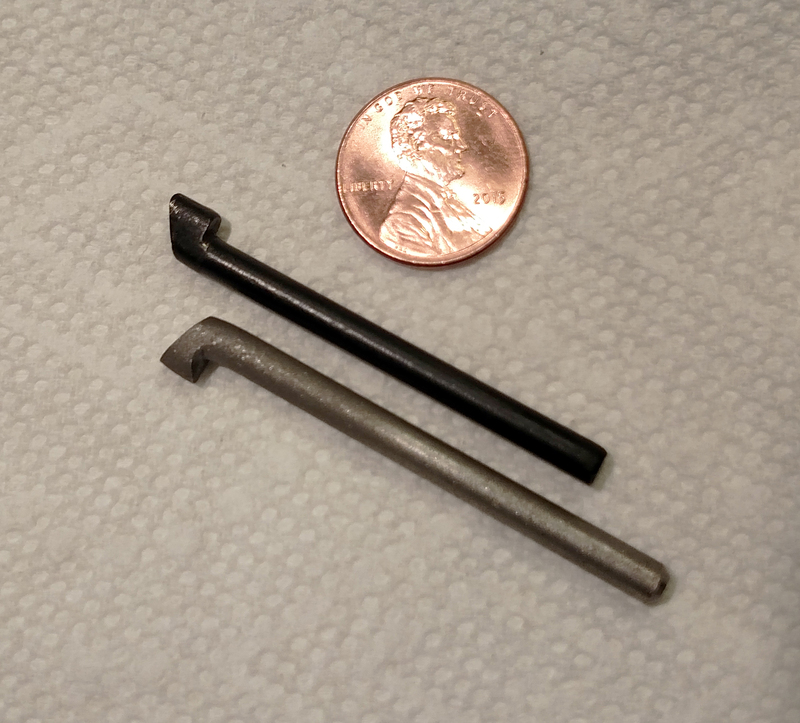 The original anodized steel pin (in black) is for a marine hatch on a customer’s boat. Over the years the coating wore off and many of them rusted to a point where they can no longer be used. We recreated a batch for the boat owner made from stainless steel, it is a little longer than the original but that was what the client specified. This was heated with a torch, upset with a hammer and belt sanded into its final shape. If you have an idea for a project or just need a repair feel free to give us a call. Our prices are competitive and our work speaks for itself. Come discover why many people have turned to Darkmoon Forge to help make their ideas a reality.